Apple pies are great, but they can have a few too many calories for some diets. If you still want to enjoy this classic dessert, you can make it a little healthier by cutting some of the sugar. After all, the apples themselves add a fair amount of sweetness, so it really doesn't need a lot of sugar to make it delicious. 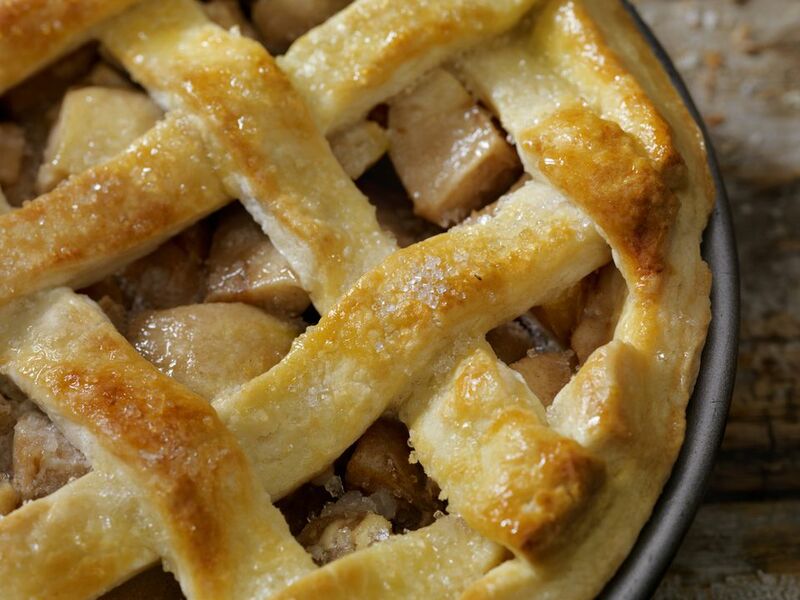 The apple pie can be on the tart side because of the Granny Smith apples. To add a healthy dose of sweetness, try serving this pie warm with a scoop of low-fat frozen yogurt or ice cream. Cut in the chilled butter, using two knives or a pastry blender. Sprinkle in the ice water, 1 tablespoon at a time into the mixture, mixing with a fork after each addition. Roll the dough into an 11-inch circle between two sheets of plastic wrap coated with cooking spray to reduce sticking. Place the dough in the refrigerator for 30 minutes so it becomes slightly firm and uniform. Remove the top sheet of plastic wrap from the pie dough. Turn the dough over into a 9-inch pie plate coated with cooking spray, and remove the remaining layer of plastic wrap. Using your fingers, press the dough into the pie plate and flute the edges. In a large bowl, toss the apples with lemon juice. In a separate bowl, combine the remaining sugars and flour. Combine the sugar mixture with the apples and toss the mixture lightly with a fork. Use a knife to cut the remaining butter into small pieces, and distribute the butter pieces over the top of the pie. Bake at 425 F for 10 minutes, then turn the heat down to 350 F and bake an additional 30 minutes.